Join us as we journey through earth’s true history at the spectacular Creation Museum with its beautiful gardens and nature trails, petting zoo, animatronic dinosaurs, and much more. Hands-on workshops show the wonder of God's marvelous designs. Creation Museum dinosaur makes a surprise appearance . . . on Smithsonian brochures. Dinosaurs Spotted Along the Nation’s Highways! The Creation Museum conducts annual advertising campaigns. This year, we have been able to secure space on more than one hundred billboards across America. 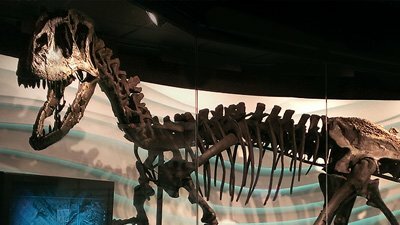 Always “Evolving”—What’s New at the Creation Museum! As we approach the fifth anniversary of the Creation Museum’s opening on May 28, we are being asked by some media outlets to reflect on the effectiveness of the museum. Atheist websites scramble to stack the deck. To help counter evolutionary teaching in astronomy, we at AiG have been doing our own kind of “beaming up,” inside our planetarium at the Creation Museum. Answers in Genesis faces an ever-increasing spiritual battle with secularists in our culture. There was even a recent incident at our Creation Museum that will shock you. An enormous mastodon skeleton greets attendees at the Southern Baptist Convention before taking up residence in the Creation Museum. A video of herpetologist Rick Teepen as he presents his Snakes Alive! workshop. Speaking of the Creation Museum . . .
Have you taken the time to tell others about the Creation Museum, a one-of-a-kind evangelistic outreach of Answers in Genesis? Gary Parker, a pioneer in creation research, will be speaking at the Creation Museum. Find out more. Take the Creation Museum Home! Did you know that you can view many of the Creation Museum videos in the comfort of your own home? AiG and the Creation Museum need your help in sharing the gospel message with even more people. Mike Matthews, AiG–U.S., asks the three founders of AiG and its Creation Museum about the past, present, and future of the ministry on the museum’s one-year anniversary. Comedian and acerbic social commentator Bill Maher sneaked past security at Answers in Genesis (AiG) headquarters to obtain footage for this anti-religion film. A story that dominated creation/evolution headlines in the past year was the opening and popularity of the Creation Museum in the Cincinnati area. Answers in Genesis’ new Creation Museum, which opened in May, originally projected 100,000 visitors by the end of its first year. Over the years, God led me to other people committed to the search for biblically and scientifically sound answers to questions that most of the world believed could only be answered by evolution.